Continue to write light commentary on librarians, parodies of legal codes, angst-ridden essays on being a writer who too often chooses not to write? War in Afghanistan, revolution suppressed in Libya, fighting in Yemen. Today there was a report of hundreds wounded in Sana’a. I have an Internet friend in Sana’a. I cried through the national news yesterday: Japan devastated by earthquake and tsunami, death and destruction, now a nuclear power plant ready to blow. When they showed the dog that brought rescuers back to its wounded friend, I had to escape to the kitchen to cook dinner. As a child, I worried about Sputnik and Kruschev banging his shoe on the table, and Cuban missiles hitting San Antonio, sixty miles from my home. We always seemed to be on the brink, but the things that went over the edge did so out of my line of sight. The world has since gotten smaller and considerably more volatile. My view is that God and Nature are telling us in the clearest language possible to stop wasting our resources on war and to start taking care of each other. 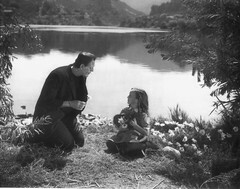 Frankenstein, after all, isn’t the monster. He’s the man who created something he didn’t understand, treated it shamelessly, and then ran away to escape the consequences. But back to the question: What is the right thing to do? Writing light seems heartless. But steeping a blog in depression doesn’t help one victim. Sharing sorrow is part of healing. Depression is a contagious disease. So. What is the right thing to do? Send what practical aid I can. Pray. Be mindful. Light all the figurative candles imaginable. Light, too, can be contagious. Image of Boris Karloff as the Frankenstein Monster, Marilyn Harris as Little Maria, 1931 by twm1340 via Flickr. CC BY SA-2.0. Please continue to write…as well as continuing to write lightly. Reminding me of Marian the librarian had me singing those songs for hours. I once thought it was pointless to write because nobody cared what I had to say, especially, in light of traumatic world events…and that was 20 years ago. Now I write for the most important audience I will ever get to know…my audience of one. I’m glad Marian had you singing. That’s the effect she has on me. I may have to get out the DVD. It’s never pointless to write, if only for ourselves. In the face of trauma, words can lighten the load. And we never know who might be reading. I’ll continue if you will. A dilemma this writer faces also, but I air on the side of the upbeat. I think we all realize what a sad mess the world is in — then again maybe not — but I think too many of use fail to see the good as world. Given a choice this is what claims my writing. Thanks for sharing. You do a great job of pointing out the good as you travel, and of showing how to look for it. Thank you for sharing, too. Sometimes, I wonder if these times are divided sharply: we laugh to make ourselves fit for the tears to come. Lovely. I’d always thought of laughing to keep from crying but never laughing to make ourselves fit for tears. You’ve given me something valuable. Thank you. Kathy, do you remember what they did in the Great Depression (not this little fillip we just had–comparatively little anyway)? They danced. I’ll be happy if I can take someone’s mind off the universal troubles and make them laugh. That’s always been my mission and I’m redoubling my efforts. The world needs some relief. When Immy gets out there, you’re going to have your heart’s desire. I’m still laughing over Hortense’s “Language.” You’re right–the world does need some relief. We might as well do what we can to that end. And I love you right back. Before too long, I might even write something for you to critique. Japan is breaking my heart. It’s all I can do to watch the news. You made me remember Kahlil Gibran: The deeper that sorrow carves into your being, the more joy you can contain. Thank you for the quotation. It’s lovely. Remembering that life offers that balance can make things easier to bear. Thanks for visiting and for commenting. I hope you’ll come again.